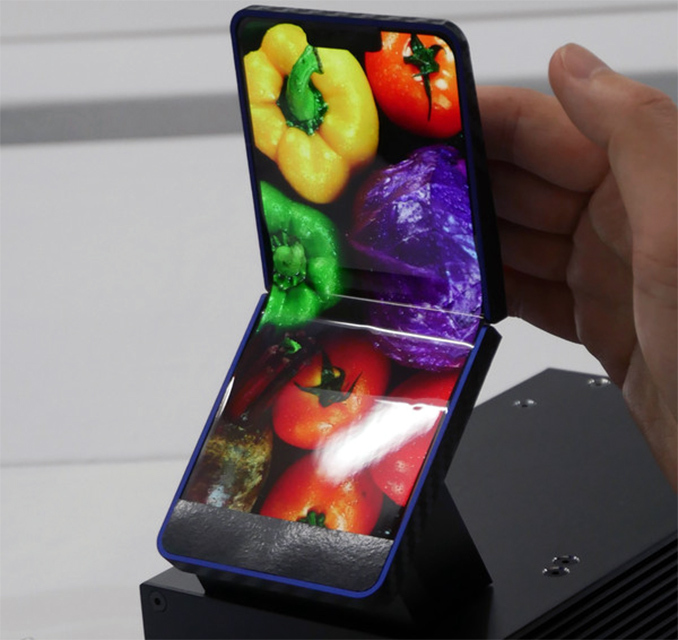 Sharp this week demonstrated its first foldable OLED display at a special event in Tokyo. At present, the device was demonstrated as a part of a smartphone prototype and right now the company is evaluating prospects of its commercialization. Sharp’s 6.18-inch foldable OLED screen features a 2992x1440 resolution, a 19:9 aspect ratio, and can cover the DCI-P3 color gamut. The display is equipped with a foldable touch panel, and polarizer, so it can be installed on a smartphone or a similar device even today, assuming that an appropriate hinge as well as electronics have been developed as well. Sharp is among a few makers of OLED displays which have publicly demonstrated their foldable OLED screens so far, so from technology point of view the company is among the leading players. 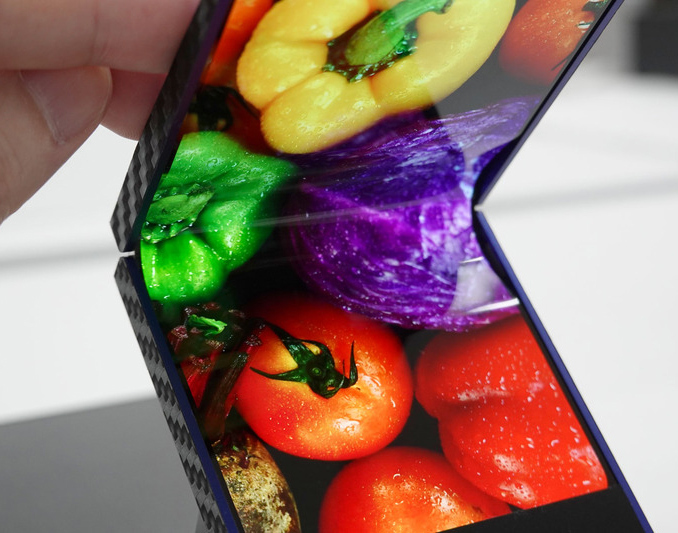 The manufacturer says that its foldable OLED displays were subjected to 300,000 of fold/unfold cycles (with a 3-mm radius) and survived them. Therefore, assuming that Sharp has tested enough screens, we can speculate that it looks like the technology is more or less robust already. That said, it is possible to expect its commercialization in the coming years. Sharp, which returned to the global market of smartphones fairly recently, already produces its own curved 6.2-inch OLED displays for its flagship Aquos Zero handset launched in January. It remains to be seen though whether the company decides to commercialize its foldable 6.18-inch OLED screen with a 19:9 aspect ratio, or will prefer another form-factor. Eh? Have you not seen pictures of the Mate X? FlexPai? Xiaomi? Oppo? The phone designs fold and leave the screen 100% unprotected. This Sharp design, Samsung's design, and even Motorola's design would have the folding screen 100% protected, but if it has any other screens, that won't be. Like Samsung's, the folding screen is protected, but the 2nd screen isn't.